African daisy 'Whirlygig', Cape daisy 'Whirlygig', South African daisy 'Whirlygig' and blue-eyed daisy 'Whirlygig'. Happy in chalk, sand or loamy soil and any soil pH. Can cope with exposed sites including coastal areas and tolerates hot and dry sites. 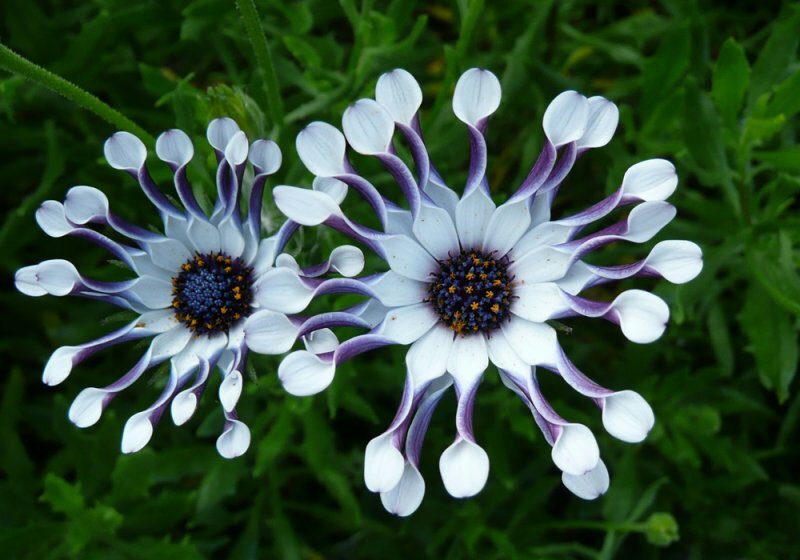 The daisy shaped, white flowers have a blue centre and deep purple edging. The petal-like rays are spoon-shaped and distinctively close up at night (a photonastic response). The aromatic, evergreen leaves are mid to dark green. A great plant for any sunny spots including in beds/borders and containers. Would be ideal in gravel or Mediterranean style gardens. While these plants can cope with dry conditions, they should not be allowed to dry out completely, particularly within two weeks of being planted. However, ensure that you don’t overwater them. Regular feeding from spring to autumn with a balanced fertiliser (weekly to monthly) will help the plant give you the best possible display. Overwinter under cover (eg a frost-free greenhouse or cold frame) to protect from the harshest of the winter conditions. 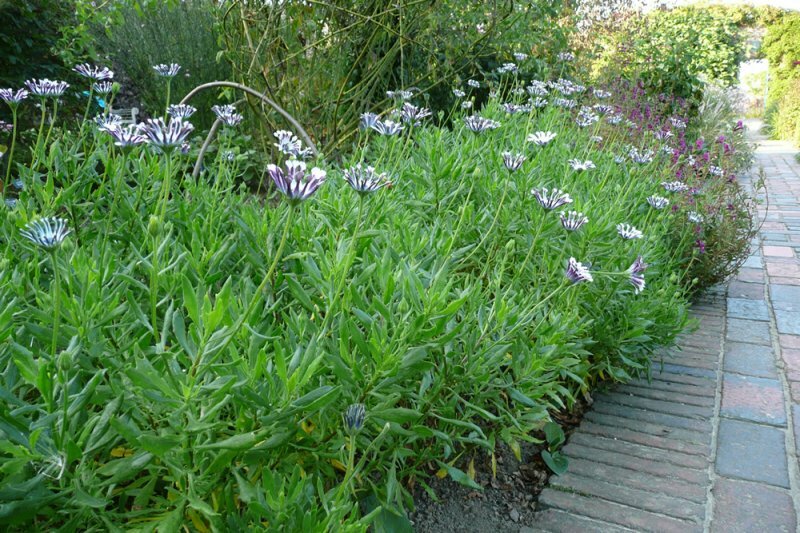 Alternatively, treat it as an annual and take cuttings each year to grow on under cover and plant out the following spring. Deadhead regularly to prolong flowering – you can remove part of the flowered stem when deadheading to keep the plant tidy. 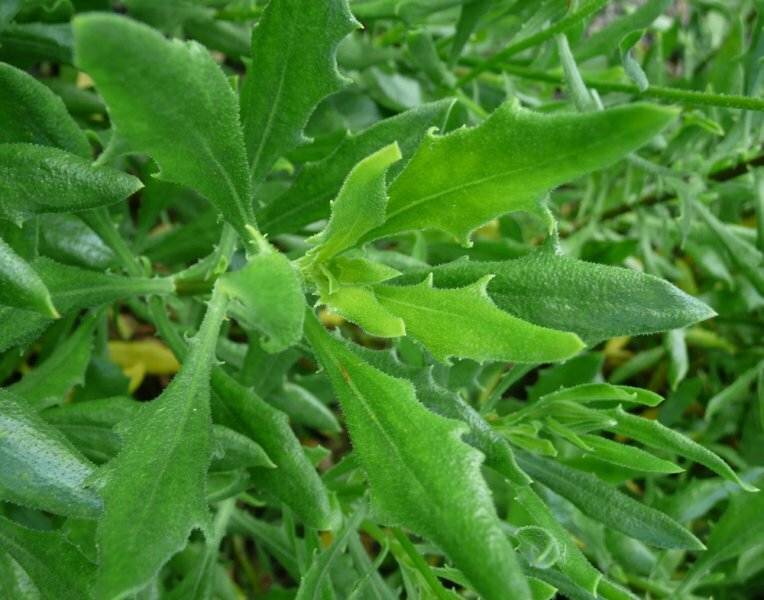 Cut back tatty or damaged stems in autumn or early spring to re-shape the plant. Take stem cuttings (softwood to semi-ripe) at any time. Can be sown from seed in spring, but collected seeds may not come true to type. Aphids may be a problem. Can be susceptible to downy mildew and verticillium wilt. The Lettuce Mosaic Virus is also known to affect osteospermums. When the flowers initially open the rays (outer petals) may not have the typical ’spoon-shaped’ appearance. Don’t panic though, they should become more spoon-shaped within a few days. The name ‘osteospermum’ derives from the Greek for bone (osteon) and seed (spermum). Plants of the genus Dimorphotheca are sometimes mistakenly sold as Osteospermum. They are similar in appearance but are annuals and do not have the lengthy flowering period of Osteospermum plants.